Fulfilling its role as a global car for General Motors, the Chevrolet Cruze will get its US debut at the Los Angeles Auto Show, open to public on 4th December. The Cruze is GM’s ‘one plug for all sockets’ car; it’s already on sale in Europe and China and it’s designed to replace various products within the GM umbrella – from our Korean sourced Optra to the US market Chevy Cobalt. The North American market Cruze will be built in Ohio, USA, but the C-segment rival to the Civic and Corolla is essentially the same car as what we’re supposed to have got back in July. The 1.8-litre ECOTEC four-cylinder is the base engine for the US (with 136bhp and 167Nm, Asian variant rated at 140bhp/177Nm) but there’s a 1.4-litre ECOTEC turbo with 138bhp and 200Nm of torque peaking below 2000rpm – proof that even the Americans are now on the downsizing wagon. Chevy claims that with this engine, the Cruze will be able to cruise for over 800km with its 57-litre tank. The US will get two six-speed transmission options – manual or tiptronic auto. For the Cruze bound for ASEAN, you’ll need to choose the automatic to have six ratios, which is a class first. The sharply styled Cruze is also sized to compete. It is about the same length as a Civic but wider and taller, and its 2685mm wheelbase is just shy of the Honda’s class leading 2700mm. It sits on GM’s new Delta II platform that also underpins the new Opel Astra, with MacPherson struts up front and a rear torsion beam suspension. 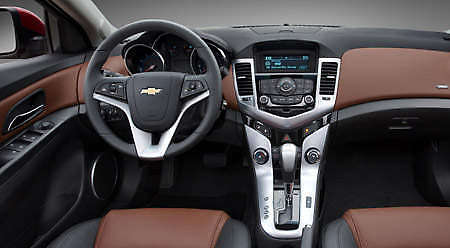 Personally, I think that the Cruze’s interior will be a major selling point in the showrooms. I had the privilege to test drive the Cruze earlier this year at the Shanghai Motor Show (where GM put on a grand show) and loved the cosy wraparound cabin which has a sense of specialness about it, rare in a humdrum family saloon. The dashboard is in the ‘dual-cockpit’ style which GM is adopting for all their new-generation models and it’s easy to see the link between this cabin and the latest Opels. A particularly nice touch is the swathe of fabric (or leather) across the passenger side of the dash. The instruments do more for style than legibility, though. We were confined to a short route in a public park (with dodging gardeners and mini tractors) so this is just an initial impression. The Cruze imparts a solid and rigid feel missing in its Japanese rivals; this plus the substantial weighting of the steering and controls makes for a believable Continental experience. The Cruze’s slightly soft gait should also translate to comfortable long distance cruising. What about the six-speed ‘box? No doubt, it’ll benefit highway economy but it’s not a match for the sharpeness and speed of the Civic’s five speeder; it’s more of the smooth, slurry type. The manual was nice though, with positive shift action and a light clutch. Our part of the world doesn’t get the 1.4 turbo, so it’s either the 1.8 or a 115bhp/150Nm 1.6-litre. The smaller engine is noticeably slower but somehow more pleasant than the 1.8; it emits less buzz and is smoother revving, just remember not to traffic light drag with the bodykitted Vios beside you! It’s hard for the likes of Chevrolet to compete against the Japanese strongmen in Malaysia when everyone is already set on buying a Honda/Toyota/Nissan, but at least a good, modern product like the Cruze will give them a fighting chance. But it seems like HICOM-Chevrolet is reluctant to get down on the field to play!